One enduring puzzle in economic history is the Great Compression – i.e. 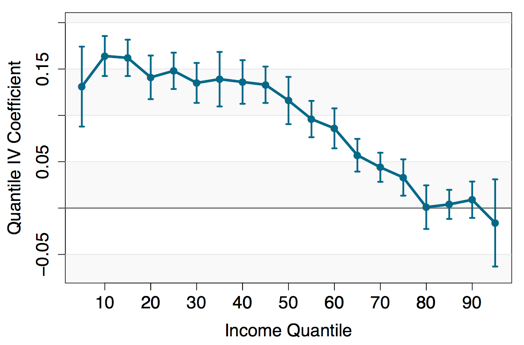 the dramatic decline in income inequality in mid-20th century US (Goldin and Margo 1992). Figure 1 shows this compression by plotting the annual Gini coefficient for male workers. 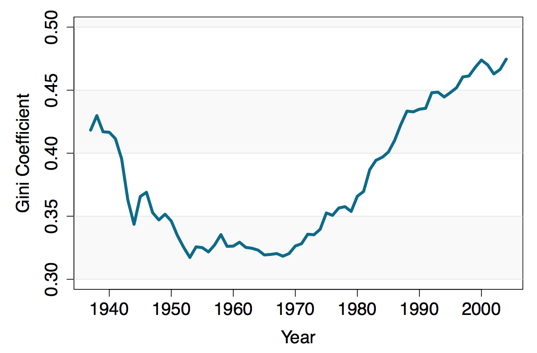 The coefficient drops steadily between 1940 and the mid-1950s before increasing to historic highs in recent years. As income inequality challenges policymakers in the present, identifying the causes of its prior decline is instructive. Previous research has focused on the interaction between technological and human-capital changes in the economy (Goldin and Katz 2008). This research has centred on the role of high-school education (Goldin and Katz 2011), while less attention has been paid to changes before high school, where much education policy focused. Source: Kopczuk et al. (2010). Notes: Figure plots the Gini coefficient for earnings of male workers in commercial and industrial occupations, ages 25 to 60, who earned more than a minimum threshold (e.g., $2,575 in 2004). Unlike modern education reform that generally emphasises the wellbeing of children as being children, much of the early progressive education movement in the US was motivated by the threat uneducated children posed to the public. These children, typically poor and either idle on the street or labouring in a factory, were the target of compulsory attendance and other related laws. In a recent paper, we use a new detailed coding of state laws affecting school attendance, together with the recently-released complete 1940 census, to examine the effect of schooling policy and returns to schooling on income inequality (Clay et al. 2016). By using the complete census, we can examine the effect education had across the complete distribution of income. We focus initially on white men for simplicity, as comparatively few women worked in 1940 and education policy for minorities was affected by additional factors such as Jim Crow laws and Rosenwald schools. Primary-school-age compulsory attendance was an ambitious task for states, which experimented with a variety of legal mechanisms to accomplish it. Compulsory attendance laws commonly stated an age at which students had to begin attending school, an age at which they could leave, and a minimum number of weeks a child had to attend. These often had exemptions for working children who had completed sufficient school and were complemented with laws requiring those children to attend continuation school.1 Like the compulsory attendance laws, continuation school laws required attendance until a certain age, and often exempted children with a certain number of years of education. Many prime-age workers in 1940 were children when these laws were initially passed, and many more were subject to age limit changes as states tinkered with laws over time. 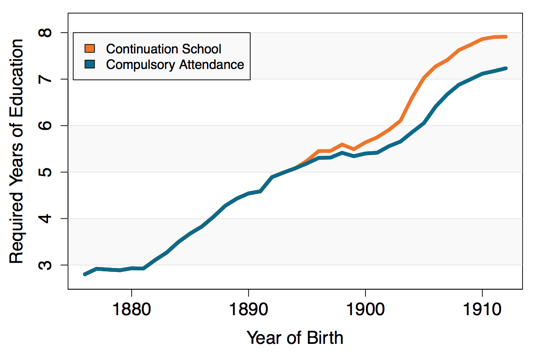 This variation in exposure to compulsory attendance and continuation school requirements lets us examine the effect of the laws by comparing birth cohorts across states. We calculate the years of required attendance for each state-year birth cohort using an iterative process that asks whether attendance was required at each year of life, based on the age limits and exemptions in place in that year. Assuming children entered school at the required age, attended each required year, left to work once possible, and attended continuation school when required, this calculation gives the number of years each child was obligated to attend. Figure 2 shows the results of this calculation, averaged across birth cohorts. Source: Calculated from age-limit requirements in state session laws. We paired the required years of schooling for each birth cohort with educational outcomes and income for each native-born white man in the 1940 census. Using a difference-in-difference design, we exploit variation in the years of schooling requirements across states over time to estimate the effect of the laws. We use specifications that account for differential trends across regions of birth to account for the fact that some regions such as the South lagged behind the rest of the country in adopting these laws (Stephens and Yang 2014).2 We find that schooling laws increased the completion of six, seven, and eight years of education (the range over which laws focused on primary-school education would be expected to bind). Notes: Each point shows the results of a separate quantile IV regression, with 95% confidence intervals. State education policies that successfully increased attendance for young children in the late 19th and early 20th centuries likely had long-term implications for earnings and inequality. While we might typically think of education as exacerbating inequality by increasing the earnings potential of the already advantaged, our analysis of schooling policy and outcomes shows that returns to schooling were highest for those at the lower end of the income distribution. This may have contributed to the narrowing of income inequality in the US mid-20th century, providing another puzzle piece to help explain the Great Compression. Clay, K, J Lingwall, and M Stephens Jr. (2016), "Laws, Educational Outcomes, and Returns to Schooling: Evidence from the Full Count 1940 Census" NBER Working Paper no. 22855. Goldin, C, and L Katz (2011), "Mass Secondary Schooling and the State: The Role of State Compulsion in the High School Movement", in D L Costa and N R Lamoreaux (eds. ), Understanding Long-Run Economic Growth: Geography, Institutions, and the Knowledge Economy, University of Chicago Press. Goldin, C, and L Katz (2008), The Race Between Education and Technology, Cambridge: Harvard University Press. Goldin, C, and R Margo (1992), "The Great Compression: The Wage Structure in the United States at Mid-century", Quarterly Journal of Economics, 107, 1-34. Kopczuk, W, E Saez, and J Song (2010), "Earnings Inequality and Mobility in the United States: Evidence from Social Security Data Since 1937", Quarterly Journal of Economics, 125, 91-128. Stephens Jr., M, and D-Y Yang (2014), "Compulsory Education and the Benefits of Schooling", American Economic Review, June, 104 (6), 1777-1792. Continuation schools were part time or evening schools that supplemented employment. We use a sample of all white men, working white men, and a restricted sample of working white men omitting those for whom income reporting might be complicated (such as the self-employed and those who only worked a limited number of weeks). The results are substantially the same when dropping Southern born men, for whom the trend in schooling laws and educational attainment grew most rapidly. In addition, while the sample is limited to native-born men due to the state of birth based identification strategy, the results are again substantially the same for those men with native-born parents.